Q: Pigeons are nesting under the eaves of my house where one roof overhangs another. How can I get them to leave my house? A: Birds will fight hard to reclaim an area where they have nested in the past. The only guaranteed way to keep them from coming back is to physically exclude them with netting. The netting must be firmly attached to the perimeter of the area, or else the pigeons will manage their way back in; they're very committed. We recommend a light, hard-to-see exclusion netting like our StealthNet. If you use chicken wire it will rust and make the problem worse, and if you use plastic netting it will probably not last more than a year or so. A: There are two products that can help you here. First, Bird Barrier's Coil can be fastened to signs with long straight ledges. If pigeons have nested, or you have individual letters to protect, you should install Bird-Flight. Bird-Flight''s firm plastic base is easy to work with, and can be glued or screwed to the sign. It's also available in three different width configurations, depending on the width of the letters. It should be noted that neither of these products will protect your sign against sparrows, just pigeons and larger birds. Arizona Wings N' Stings sells three different access systems: 1) Zippers can be hog-ringed into the netting allowing panels to be removed, doors to be opened, or light bulbs to be changed. We sell high-grade marine grade zippers which can withstand years of sunlight, and remain very functional. A photographic description of this system can be found in Products. 2) Bird Barrier manufactures small "net clips" which are thin stainless steel clips, and can allow area access like the zippers. Net clips are much less visible than zippers, but require more busy work to operate. They are usually ideal for small access needs like light bulbs. 3) The last option is to install the perimeter cable with open hooks, which will actually enable you to remove the entire net system and then replace it. Contact our company for more information, or see the hardware section of Netting. A: When you say parapet we assume it's unprotected (no shelter overhead), and thus not a "roost" or "nesting site" for pigeons. You can use Coil, Birdwire, Bird-Flight or Bird-Shock systems depending upon considerations such as visibility, cost, and ease of installation to keep unwanted pigeons from landing. For light to medium pressure we generally recommend the Coil or the Birdwire. Both products are relatively inexpensive, the Coil is much easier to install, but the Birdwire is less visible than the Coil (both products are literally impossible to detect from 75 feet or more). Both are stainless steel and will last for many years. A: Sticky gels have been a part of the bird control industry for about twenty years. While they have been somewhat effective at keeping birds from landing on ledges, they have been known to cause bigger problems than they solved. First and foremost, these gels are very sticky and are hard to remove from buildings (especially when applied to a porous surface like stone or concrete). The gels generally turn black over time thanks to dust, pollution and other airborne matter, making a real mess. Gels also have a bad habit of dripping off the ledge when it gets real hot. Additionally they can entrap small birds (causing them to die slow, painful deaths), and cause all sorts of problems for workers or painters who come across gel-laden ledges. And finally, gels are generally not guaranteed for more than one year so they are, at best, a short term solution. Arizona Wings N' Stings has the option to sell a gel, but believes the a physical metal (long lasting) barrier can be installed in the same situation. A: Like the question above regarding plastic owls and other scare devices, these products can work " sometimes" for a short period of time, but hardly ever solve the large-scale problems they are advertised for. They can be somewhat effective in some situations, but largely we believe they are not worth the investment. We've seen pigeons nesting right next to such devices. If you want to give them a try, please make sure you buy from a reputable company that offers a money-back guarantee if you are not completely satisfied. 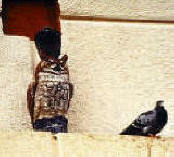 Q: Is trapping a good way to get rid of birds that are doing their business on my building? A: Trapping is definitely an effective way to remove specific birds that are causing you problems, But, this should not be considered a long-term solution. If birds are trapped, they literally have to be euthanized, otherwise they will return (remember, pigeons are descendants of homing pigeons). If birds are trapped and euthanized, other birds will simply move in because the situations that attracted your old birds still remain. Arizona Wings N' Stings recommends trapping as a way of reducing the current population or to remove committed birds from an area before permanent exclusion products like the kind we install, are installed. You may save more money in the long run by installing permanent products than paying to trap your pest birds on a monthly basis. A: There's really only one way, total exclusion using netting. StealthNet can be installed over any A/C. system to permanently exclude birds from the area. If birds are getting under the A/C unit and the base is raised we can exclude birds by closing off the under side with StealthNet or hardware screen. If the system in installed in a recessed area, the netting can simply be installed over the pit. If the system is raised above the roof, then support cables can be stretched between poles (installed for this purpose), which support a structure made of net. And remember (from question asked above), you can get into these areas by installing zippers or net clips into the netting. Q: I've got a large airplane hangar with lots of beams and pipes which seem to attract lots of pigeons. They're making a mess on our customer's airplanes, and that's causing all sorts of health problems and damaging the paint on the planes. I hung one of those scary eyes balloons from one of the beams and it made no difference. What can we do? A: You can either spend lots of money and install ledge products (like Bird Barrier's Bird-Flight on every ledge where the birds perch, or you can install StealthNet under the entire ceiling, excluding birds from flying up to their old familiar perches. The use of a Birdblaster system can also be used to scare birds from a hangar. Arizona Wings N' Stings actually specializes in large commercial netting applications like yours, so please contact us and we'll get a service person out to give you a free quote on what we can do for you. A: Your concern is valid. Very often birds will move over a little bit and still be on the building. You might want to consider altering other conditions that the birds find attractive. Are they nesting elsewhere on your house? Are you feeding them? If you cannot make the area inhospitable by changing conditions you really have only three other hopes: 1) Install a Screech Owl at a high point on your roof. This plastic owl rotates on a base, and actually screeches like a hawk, and barks like a dog (not too loud, don't worry), every five minutes. These have been very effective against pigeons. 2) You can install Bird-Shock Electrified Track on the peak. This will shock the birds that land on it, and will give you the results you're seeking. Bird-Shock can be tricky to install, and more expensive as compared to the Screech Owl but the results will be much better. Q: Can I use an ultrasound machine, fake owl or rubber snake to get rid of nuisance birds? A: Purdue University has studies these units and devices and have found them not to be effective. Q: Can nuisance birds be trapped to eliminate the problem? A: Yes. They can be trapped and eliminate the bird problem, but it can be time consuming. Q: Does Arizona Wings N' Stings offer programs to treat Pigeons? Starlings? Sparrows? A: Absolutely! Arizona Wings N' Stings is a full service bird control and exclusion company. Q: I thought birds were protected by Federal Law? A: You're right, most birds are protected. But here in Arizona, pigeons, starlings and house sparrows are not. The main reasons are that they transmit diseases, contaminate food in or near food and grain handling facilities, carry ectoparasites (lice, mites, bedbugs, fleas, ticks, etc.) and abandon nests which can harbor stored product insects. Q: What other methods of bird control are there? A: There are spikes, netting, post and wire, flock alarming chemicals, but each case needs to be dealt with case by case. There are many ways to control bird problems and many mechanical ways to control them. Q: I have a lot of pigeon droppings around. Can I clean it up myself? A: It is not recommended. Pigeon droppings carry many diseases that can be harmful. You should call a professional that has all the correct safety equipment. Arizona Wings N' Stings specializes in bird dropping and nest material removal. Q: I don't want to kill the birds, just get rid of them. Can it be done without killing them? A: By knowing the natural instinct of the bird you want to control, you can effectively interface their basic biological needs and use mechanical devices to rid them from the area. Q: Birds often fly into our window. What can I do? A: You need to cover the window from the outside so they don't see their reflection and won't crash into your window. Netting or a sheet placed outside is best. Q: How long will it take to get rid of the birds? And will the birds go away on their own? A: The answer is site specific and depends on the level of pressure on site. But normally, birds are very committed to their nesting and/or roosting sites (they consider this area home). One-stop access to US Government avian and pandemic flu information. ... Flyway map demonstrates how migratory birds blanket North America. A: Keep your doors closed. If that is not possible, then you really have only two viable options: 1) install netting under the entire ceiling using StealthNet, making sure it firmly seals up against the four walls. This will prevent sparrows from flying up to their perches. The netting must be 3/4" mesh, otherwise the sparrows will fly through the net. 2) If your warehouse is very large and you cannot afford a program as outlined above, you can undertake a program of trapping, harassment and regular nest removal program. Sparrows are persistent birds, however, and most will simply try and try again, and you will end up contributing many man hours to this task, which may cost you more than a solid netting job in the first place. Q: I've seen sparrows, or some small bird, flying into cracks in our building. Should I be worried, and what can I do about it? A: You probably have a family of sparrows living somewhere in your building, probably above a false ceiling. Yes, you should be concerned; the birds need to be removed, and the cracks where they are entering must be repaired. You could contact your contractor or we can do the repairs for you. Q: Every spring swallows build mud nests on our house under the eaves. They leave a mess on the walls and on the ground. What can we do? Q: How can I keep black birds out of trees? They seem to come every year in the fall and make a horrible mess on the benches and ground under the trees. A: Trees are very hard to protect from birds that migrate, or "attack" at certain times of the year. The only 100 percent solution is netting. StealthNet can be installed over a tree and removed after the threat has gone, and re-used for years to come, assuming the tree is trimmed to nearly the same size every year. In agricultural settings, there has been tremendous success with the Helikite, a helium balloon/nylon kite combo that hovers above a trouble area and mimic's a large bird of prey. These have been known to eliminate birds from up to 26 acres per kite. As with all visual scare devices sometimes they work and sometime they don't. Q: I have woodpeckers making holes in my home. What can I do? Q: Woodpeckers are drilling holes in my house. How can I stop them? A: They are most likely looking for food or drumming to attract a mate. Luckily there are several things you can do to deter them. Usually if you can deter them for a few days they'll take their drumming to a new location. You can move them by hanging Scare-Eye Balloons and or Flash Tape in their vicinity. These reflective deterrents create an area of discomfort; basically the woodpecker would rather go elsewhere to peck. Arizona Wings N' Stings also offers two exciting products that have shown some promise on telephone poles (woodpeckers love to peck telephone poles). A new liquid spray can be applied to the side of your house, and the smell deters the pests (but not you, in case you were wondering). We also offer a hole-filler with the same aromatic qualities that will drive them away from holes they try to peck after you've filled them. The spray is one quart and covers 400 square feet, and the hole filler is a two part mix that makes about 2 pints. Woodpecker products. Q: How can I keep birds from stealing fish from our ponds? The ponds are large, about 100 by 500 feet, so I don't believe they can be netted off. Please help!